The White Plague, a marvelous and terrifyingly plausible blend of fiction and visionary theme, tells of one man who is pushed over the edge of sanity by the senseless murder of his family and who, reappearing several months later as the so-called Madman, unleashes a terrible plague upon the human race—one that zeros in, unerringly and fatally, on women. A warm day in Dublin, a crowded street corner. Suddenly, a car-bomb explodes, killing and injuring scores of innocent people. From the second-floor window of a building across the street, a visiting American watches, helpless, as his beloved wife and children are sacrificed in the heat and fire of someone else's cause. From this shocking beginning, the author of the phenomenal Dune series has created a masterpiece. 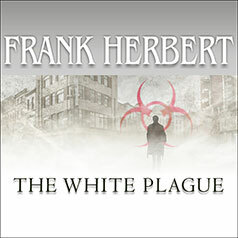 The White Plague is a marvelous and terrifyingly plausible blend of fiction and visionary theme. It tells of one man's revenge, of the man watching from the window who is pushed over the edge of sanity by the senseless murder of his family and who, reappearing several months later as the so-called Madman, unleashes a terrible vengeance upon the human race. For John Roe O'Neill is a molecular biologist who has the knowledge, and now the motivation, to devise and disseminate a genetically carried plague—a plague to which, like those that scourged mankind centuries ago, there is no antidote, but one that zeros in, unerringly and fatally, on women. As the world slowly recognizes the reality of peril, as its politicians and scientists strive desperately to save themselves and their society from the prospect of human extinction, so does Frank Herbert grapple with one of the great themes of contemporary life: the enormous dangers that lurk at the dark edges of science. The White Plague is a prophetic, believable, and utterly compelling novel.